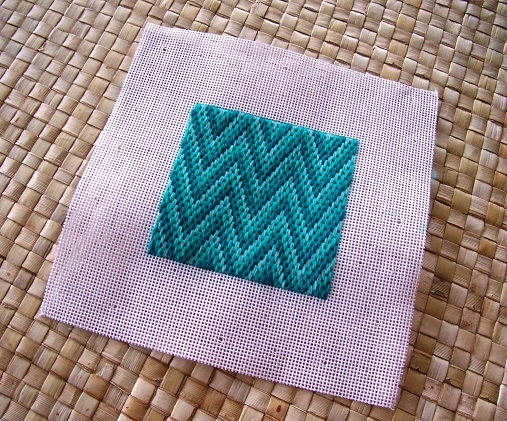 I enjoy needlework-and-crafts ; but mostly I am passionate about bargello-needlepoint . Unlike traditional stitches that are worked diagonally across a single needlepoint-canvas thread; most bargello-stitches are worked either horizontally or vertically across two to eight canvas threads to form beautiful as well as intricate patterns. A couple of years ago, I undertook a project to stitch a six-inch square sample of a different bargello-pattern each day for 365 days. Beginning January first of that year, and each day through December 31st, I painstakingly stitched a unique bargello-design for at least one-hour each day. The inspiration came from my personal library of needlepoint-books . I’d like to share some of my favorite bargello-samples with you over the coming weeks and months. This first design is a traditional flame-pattern that is worked over four canvas threads and up two each time a stitch is made. I chose three shades of turquoise silk to create a jewel effect.